SAN FRANCISCO - The Cold War has been over for nearly two decades, but the threat of a nuclear winter still looms. Even relatively small, regional nuclear conflicts could produce widespread fires large enough to reach into the upper atmosphere and induce a decade of global climate cooling, according to new research presented Monday at the American Geophysical Union's (AGU) fall meeting in San Francisco. The findings suggest that climatic effects from even a small-scale nuclear war between states such as India and Pakistan could match the climate impact once predicted for an all-out attack by a superpower. Nuclear proliferation peaked in 1986, and worldwide stockpiles of weapons began to decrease sharply as the Soviet Union disintegrated and superpowers disarmed. But although the total global arsenal is now only a third of its peak size, 40 countries now possess the materials to make nuclear weapons, Brian Toon, an atmospheric scientist at the University of Colorado at Boulder, said at the AGU meeting. The combination of such new, often politically unstable nuclear powers and the increasing number of "megacities" with high population densities has now put the planet "at a perilous crossroads," Toon said. A plume of smoke more than 250 kilometers wide  caused by bushfires in the Great Dividing Range Mountains  flowed across the Victoria-New South Wales border in Australia on Dec. 12. Such fires rarely reach the stratosphere. Smoke from fires caused by even a small-scale nuclear war could reach the stratosphere, however, with potentially devastating climate effects worldwide, according to research presented Monday at the fall meeting of the American Geophysical Union. Image is courtesy of the MODIS Rapid Response Team, NASA Goddard Space Flight Center. Toon's study, which he said is the "first comprehensive quantitative study of consequences between smaller nuclear states," presents new atmospheric models that predict what would happen to the global climate if 50 15-kiloton weapons  equivalent to the total arsenal of India and Pakistan  were detonated. Although scientists conducted similar studies in the 1980s to determine the potential dangers of nuclear conflict on climate, they lacked the high-resolution models available today, said Alan Robock, an atmospheric scientist at Rutgers University, who worked with Toon and is lead author on a related study also presented at the AGU meeting. "The goal of the study was to see whether we could still produce a nuclear winter with the current arsenal," said Robock, who, along with Toon, produced some of the first models of potential nuclear effects on climate in the early 1980s. The new models incorporate a factor that was largely unforeseen two decades ago: Nuclear weapons not only produce deadly radiation, but can also ignite massive fires on a scale rarely seen on Earth, with far-reaching atmospheric impacts. "A nuclear weapon is very unique in starting fires," said Richard Turco, an atmospheric scientist at the University of California at Los Angeles, who was a co-author on Toon's paper and also helped shape the early 1980s modeling of nuclear winter. "It's a release of intense radiation that has the same spectral characteristics of sunlight. It's like bringing a piece of the sun to Earth." That "piece of sun" can ignite as much as 10 to 15 square kilometers, he said. Large wildfires inject smoke, largely composed of black carbon, into the upper troposphere, where it is ultimately rained out. However, the models suggest that if enough fires ignited at once  such as a giant fireball produced by a nuclear explosion  their smoke would form a massive cumulous cloud in the troposphere. When warmed by the sun, the cloud could induce large-scale circulation that could lob it even higher into the stratosphere, Toon said. Once in the stratosphere, the smoke would not be rained out, but could persist far longer and travel around the globe. Although rare, such "lofting" has been observed in nature with forest fires, Toon said. 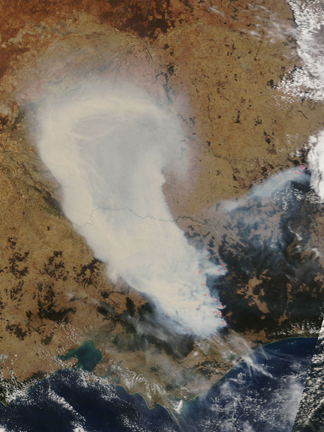 The Chisholm fire, a massive wildfire that raged in Alberta, Canada, in May 2001, created a massive fire plume, called a "pyro-cumulonimbus," that released five kilotons of smoke and produced enough energy to send it soaring into the stratosphere, said Michael Fromm, a meteorologist at the U.S. Naval Research Laboratory. The ultimate effect of catapulting so much smoke into the stratosphere would be to reduce the amount of sunlight reaching Earth, thus cooling surface temperatures by several degrees Celsius over large areas of North America and Eurasia, reducing the average global growing season and reducing precipitation by 10 percent of the current global average, Robock said. Although such effects would change the ultimate profile of the controversial "hockey stick" climate predictions, Robock said, "it's not a solution to global warming."